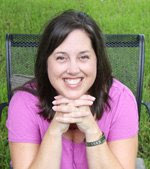 When you need a quick card (I'm talking done and out of the door in 10-minutes or less) try out a card kit. Now, I'm not a huge fan of "kits" of any kind, scrapbook pages, etc., but I do have a few kits from Basic Grey in my stash for these last minute occasions. 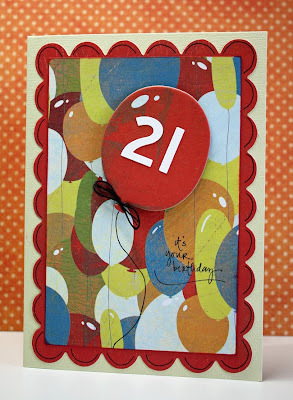 Here's one I made using the "Cupcake" birthday card kit: With kits, all of the complicated work is done for you....everything fits and coordinates so nicely. And, you can always add a few touches of your own design to whatever is included in the kit. 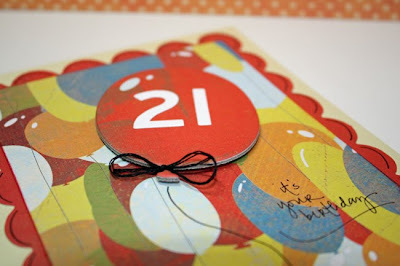 In this case I added the numbers "21" to the balloon, as well as the bow and the black doodling around the edges.